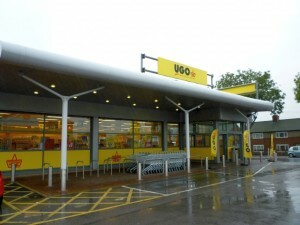 The emergence of UGO as Britain’s newest discount supermarket chain has been one of the most interesting retail launches of 2011 so far. 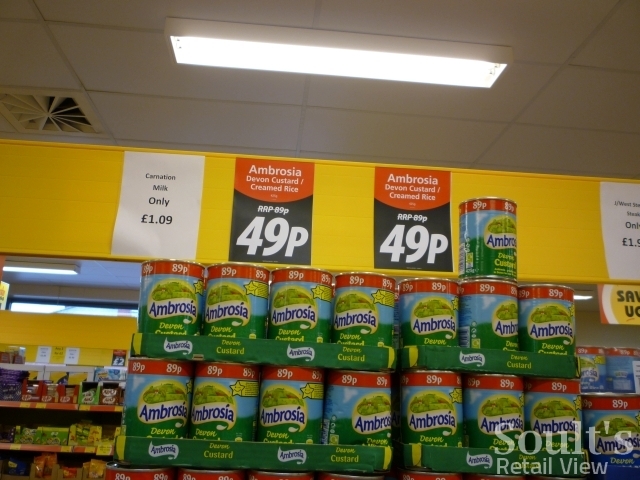 Back in January, I reported on Asda’s OFT-instigated divestment of 47 Netto stores, and the news that Haldanes would be buying 20 of those sites for a new discount fascia, UGO. 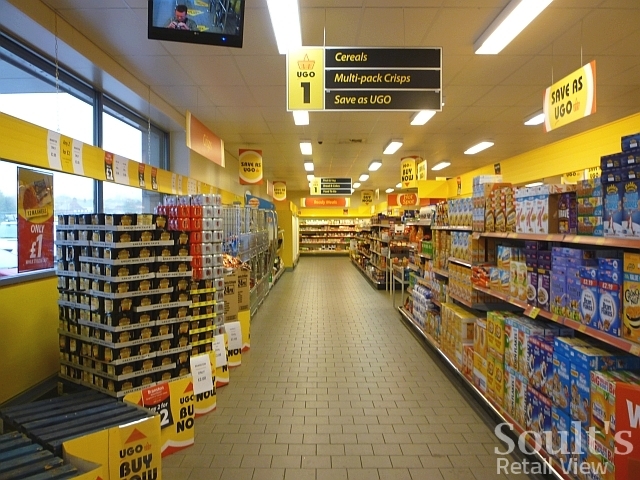 Subsequently, I wrote about Haldanes’ intention to make UGO “the icing on the Netto cake”, seeking to keep the best of Netto – including its familiar yellow and black corporate colours – while bringing in an enlarged product range and additional services. UGO’s birth hasn’t been straightforward, however. When I visited the Eston and Hartlepool shops, on Teesside, in May, I praised the stores’ external appearance and great offers, but highlighted some concerns regarding availability, instore signage and customer service. Two months later, when I interviewed UGO’s boss, Arthur Harris, he was having to contend with the fallout from the collapse of the eponymous Haldanes chain, as well as a need, in his own words, for the UGO stores “to trade a little bit better”. 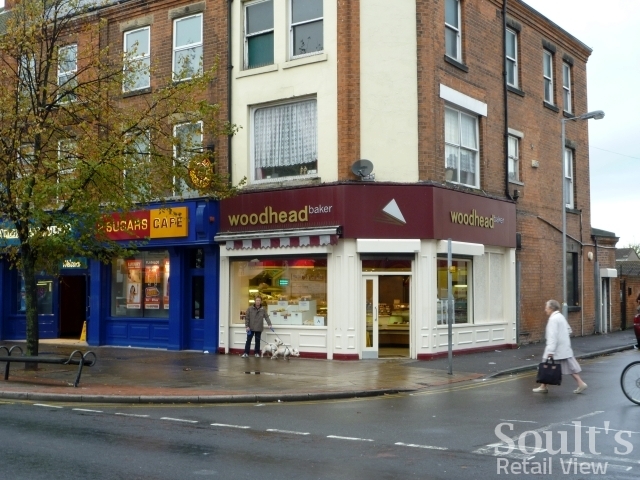 He promised, however, that “every fix possible” would be looked at, addressing key issues such as IT and ordering, product range and price, and developing vertical integration by introducing bread, cakes and pies from the recently acquired Woodhead Bakery. 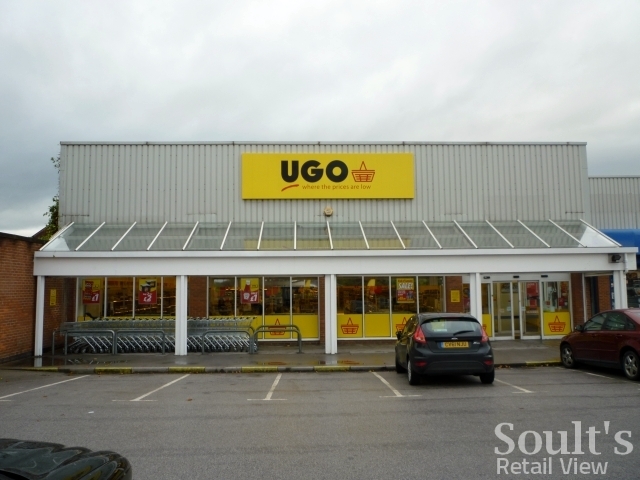 A few weeks ago, at UGO’s invitation, I went to visit some UGO stores – Lundwood and Monk Bretton in Barnsley, and Eton Street (Boulevard) and Boothferry in Hull – for the first time since my Teesside trip. I was keen to see how the stores were getting on; look at what had changed from five months earlier; and have a chat with the store’s managers and staff. So, how did the Barnsley and Hull stores fare under the five headings that I’d reviewed before: first impressions; instore signage; product range and availability; price; and customer service? On Teesside, I praised both UGO stores’ bold and bright exteriors, and the Barnsley and Hull stores didn’t disappoint in this regard. As I observed before, UGO’s visual identity is clearly and openly inspired by that of Netto, but Darlington-based agency Charles Hollywood has done a great job of creating an overall look that combines eyecatching signage with banners and window vinyls. All four of the stores that I visited were highly visible – and very hard to miss – when arriving by car. 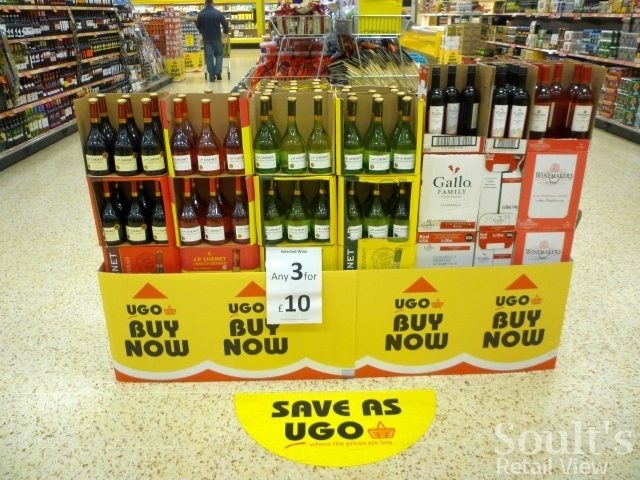 To complement the permanent signage and banners, each of the stores was recently given a £200 budget to spend as they saw fit on materials to promote October’s ‘3 for £10’ wine offer – a clever way of both engaging the store teams and, potentially, coming up with some new and creative promotional ideas. While some stores opted for leafleting, window posters or PR activity, Monk Bretton’s huge banner – impossible to miss from the roundabout adjacent to the store – probably wins the prize for making the biggest impact. 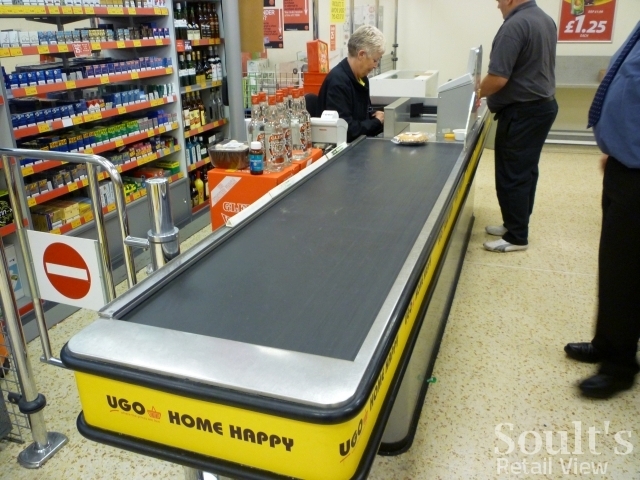 Happily, all the promotional activity does seem to be having the desired effect in generating awareness of UGO and, in turn, an increase in footfall and spend. While I was visiting the stores, there were decent numbers of people arriving both by car and on foot. Not enough to make the stores or their car parks really busy yet, but certainly an improvement on the occasionally eerie quietness that I experienced in May. This is backed up by UGO’s own figures, which show impressive week-on-week sales growth in the fortnight proceeding my visit, including a 36% increase at Nuneaton, 31% at Ashington and 26% at Stanley. 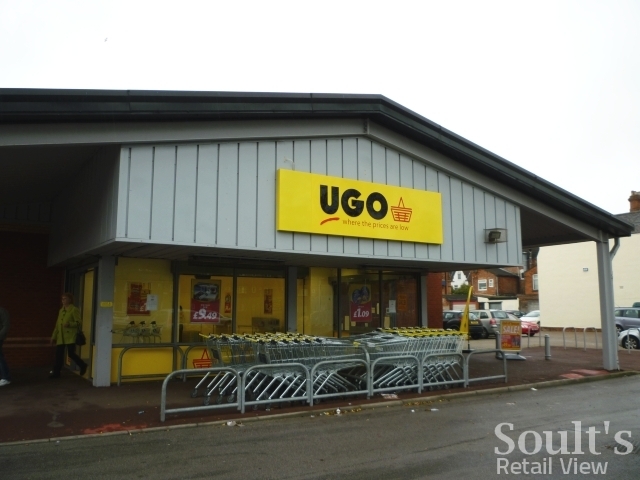 The quality of the estate that UGO has inherited from Netto is also an advantage in creating a positive first impression and drawing shoppers in, with the buildings themselves looking smart and appealing. While the Eston store that I visited previously felt comparatively small and dark, this seems to be the exception rather than the rule. 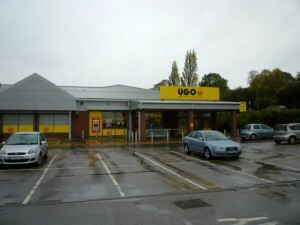 Apart from the slightly older-looking Boothferry shop – which, like Eston, shares a parade with other retail units – the UGO stores that I visited in Barnsley and Hull are good-sized, modern stores, more comparable in look and feel to the Hartlepool branch. 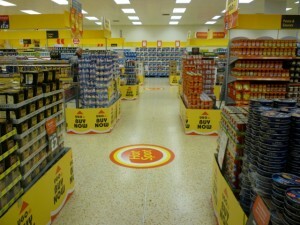 Monk Bretton, for example, only opened as Netto in 2008, while Lundwood benefited from a major refurbishment in the same year. On entering the stores, the bright and modern feel continues. 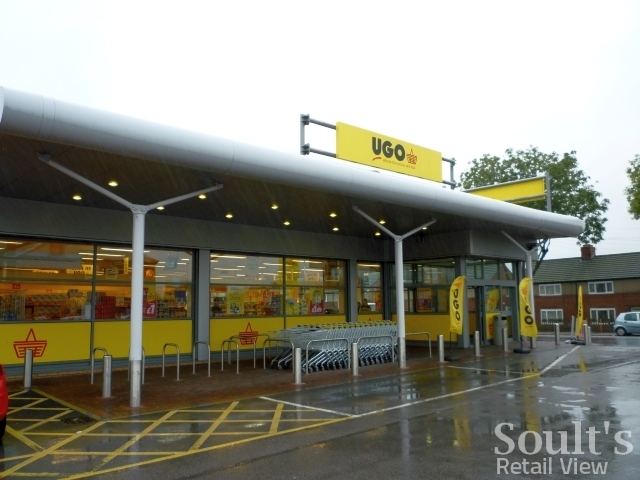 Where the ex-Netto stores taken over by Asda and Morrisons have enjoyed a comprehensive internal refit, UGO’s ‘Netto-plus’ model relies on the existing walls, flooring, ceilings, shelving and equipment being in good shape – which they generally are. Where UGO is doing especially well, however, is in maintaining the overall tidiness and cleanliness of its stores. 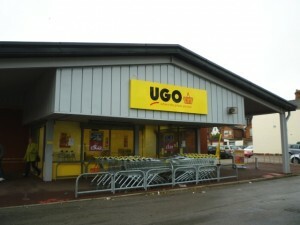 Netto’s shops sometimes had a reputation for being messy, and the spotlessness of the stores as UGO is apparently one of the main differences that shoppers have noticed, and welcomed. Of course, a cynic could argue that because business is still quieter than it was as Netto, the stores have less chance to get dirty and the staff more time to keep them clean. It’s not a given, however – there are plenty of other stores where lack of customers doesn’t translate into a spick-and-span shopfloor, and the UGO managers’ evident pride in their store environments is commendable. 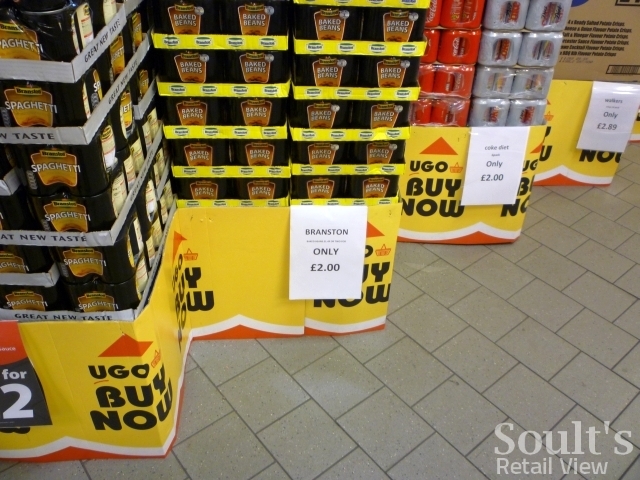 After visiting Hartlepool and Eston in May, I praised the way in which the UGO brand was implemented instore, with a consistent colour palette and tone of voice running throughout the posters, navigational signage and other point-of-sale materials. Pleasingly, this is the case in Barnsley and Hull too, from the fun ‘UGO for a basket’ cutout that greets you at the entrance to the ‘Mind how UGO’ exhortation as you leave. 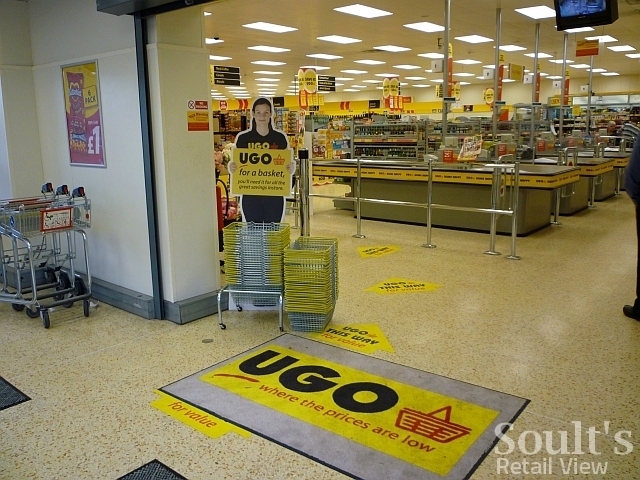 I particularly like the good-quality UGO-branded doormats, which add a splash of colour as you enter the stores, and help to prevent the floors getting too slippy. On the very wet day that I visited, the mats were looking a bit mucky from all the dirty feet that had used them – as long as they clean up OK, however, it shows that they’re doing their job. Amid a generally high level of attention to detail, the scrappy handwritten signage that I previously spotted at Eston and Hartlepool stood out for the wrong reasons. 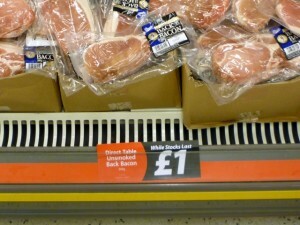 Pleasingly, however, there was no sign of anything similar in the Barnsley or Hull stores. 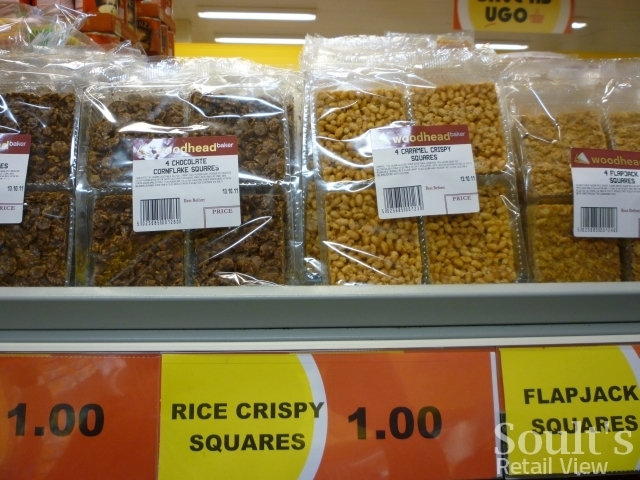 Current product signage is a combination of centrally- and instore-produced A4 posters, and I spotted a variety of approaches while visiting the four stores. The centrally-produced posters were typically red and black, and stood out well against the yellow backdrop; in contrast, the instore-produced signage at all four stores, printed on plain white paper, was neat but a little lacking in professionalism. In a few cases, I also spotted a need for a proofreader to catch some of the misspellings before they make it onto the shopfloor! 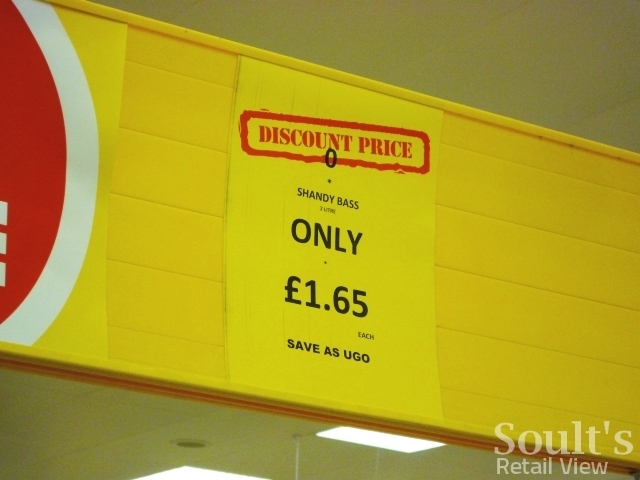 At Eton Street, I noticed some of the old Netto ‘Discount Price’ paper being used up, and the yellow and red colour scheme works well in allowing the store-produced signage to fit better with the overall look and feel of the UGO brand. I’m told that UGO is about to produce its own A4 poster template, featuring a red frame around a yellow field, and this will be a welcome replacement for the underwhelming white posters in due course. 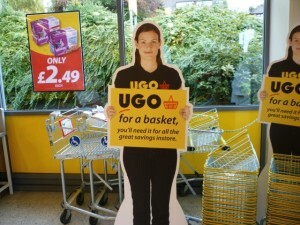 Another effective visual device in all the stores is the UGO-branded ‘pallet wraps’. 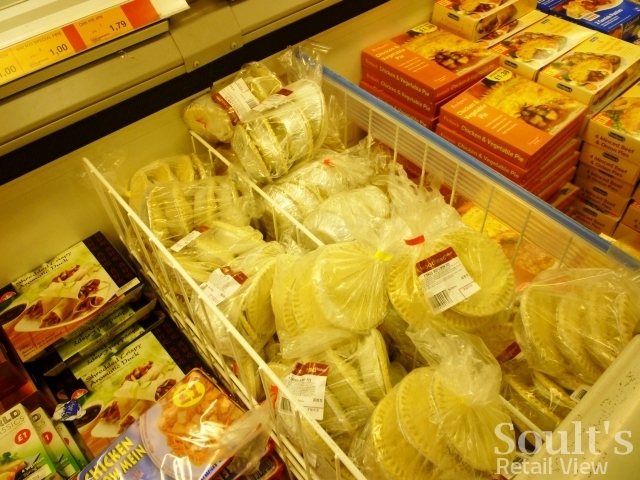 At Lundwood, for instance, the store was using long stretches of the wraps around its promotional and non-food sections, which worked well, as intended, at disguising the unattractive pallets. However, I especially liked the way that Eton Street had used the wraps in shorter stretches, around its end-of-aisle displays. 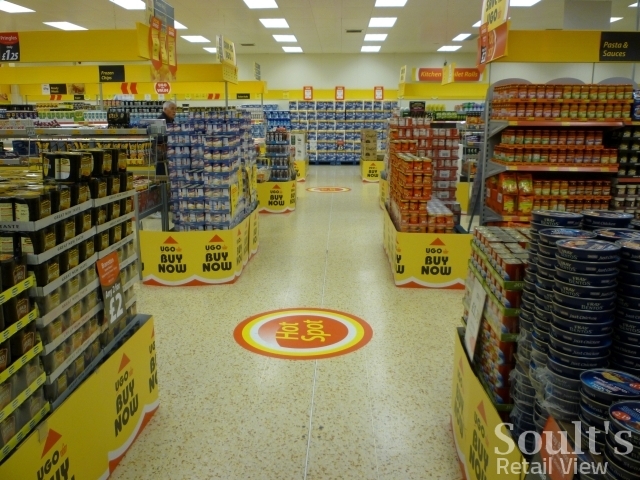 This seemed to work really well in creating a visual link with the other yellow elements of the store, and particularly in drawing the eye down the centre aisle. Attention to detail is important here – making sure that the wraps are clean, that the corners are neat and sharp, and that the wraps don’t (as I spotted in one store) overlap in such a way that the text is partly obscured. Gaps on shelves were a problem when I visited the UGO stores in Hartlepool and Eston in May. However, a combination of sorting out the chain’s IT and ordering systems, and some judicious pruning to what Arthur Harris quickly recognised was an over-ambitious product range, seems to have done the trick. 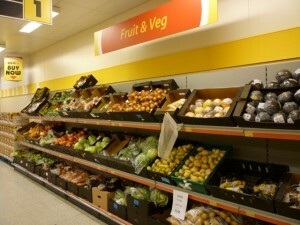 The fruit and veg sections – problem areas at both Eston and Hartlepool five months ago – were well equipped in all four of the Barnsley and Hull stores that I visited. 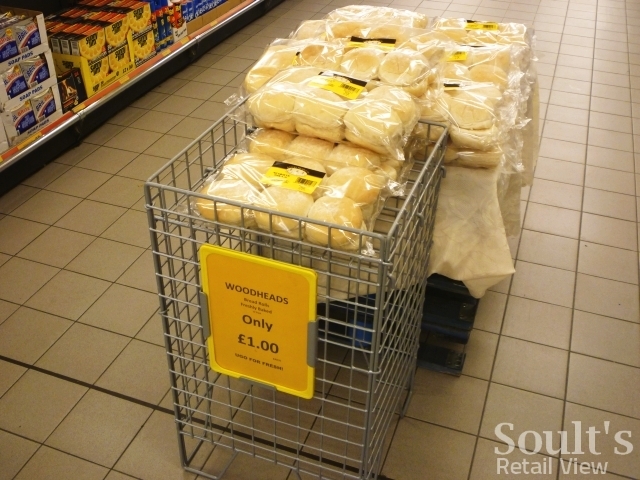 Perhaps the biggest product change, however, is the introduction of Woodhead Bakery ranges across all the stores. 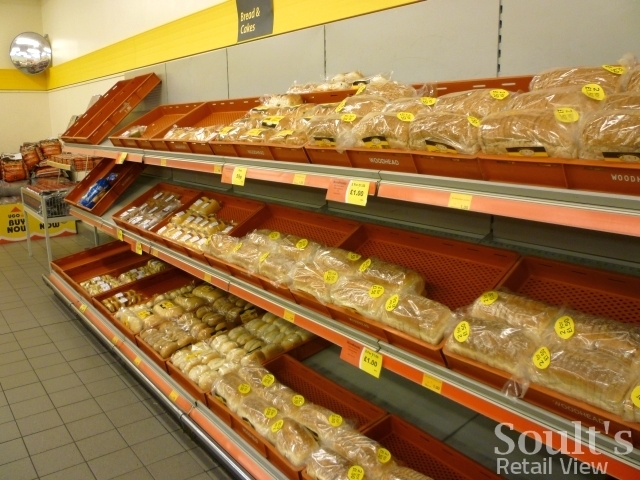 This is a real point of difference for UGO, given that Woodhead-badged products have previously only been sold through the bakery’s own stores across the north of England. However, the purchase of the bakery by UGO’s parent company earlier this year has created great opportunities for vertical integration, as well as the ability to capitalise on a familiar and respected northern brand. 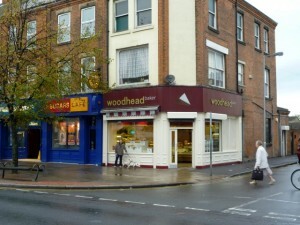 Just around the corner from Eton Street’s UGO, for example, I spotted a Woodhead branch on the busy Hessle Road. Given the benefits to the wider Haldane Retail Group, UGO’s store managers are, as you would expect, being encouraged to push the Woodhead ranges, and all the stores I visited had products such as bread, rolls, fruit pies and cakes prominently displayed. All the store managers I spoke to reported that the Woodhead ranges were selling really well, and it’s not surprising – the products look fresh and attractive, and are very competitively priced. 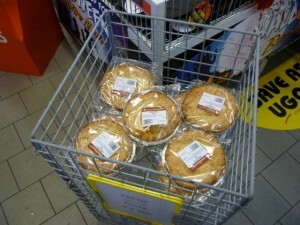 One of the biggest sellers is apparently the 12-pack of white rolls for £1, while the large apple pies for £1 were also attracting plenty of attention. 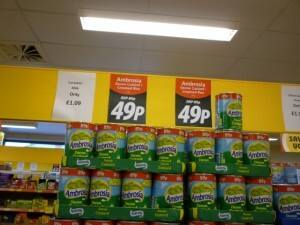 These prices are almost identical to those in Asda, so are very reasonable for a smaller chain. 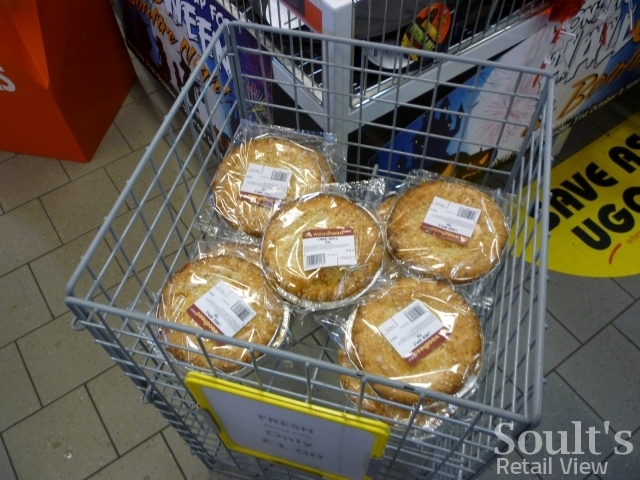 The 4-pack of Woodhead frozen chicken pies for £1.79 also seemed like a great deal – combining the convenience of frozen with simple packaging that lets the product, and its ‘homemadeness’, speak for itself. 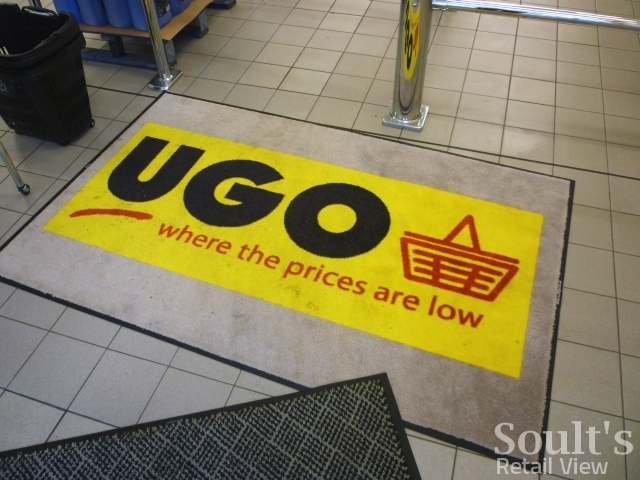 That issue of price is clearly at the heart of UGO getting its offer right, given that it’s modelling itself on Netto and uses “where the prices are low” as its strapline. When I interviewed Arthur Harris in June, he admitted that UGO needed to address the perception – and, to some extent at least, the reality – of it being more expensive than Netto. Again, there seems to be good progress on this front. 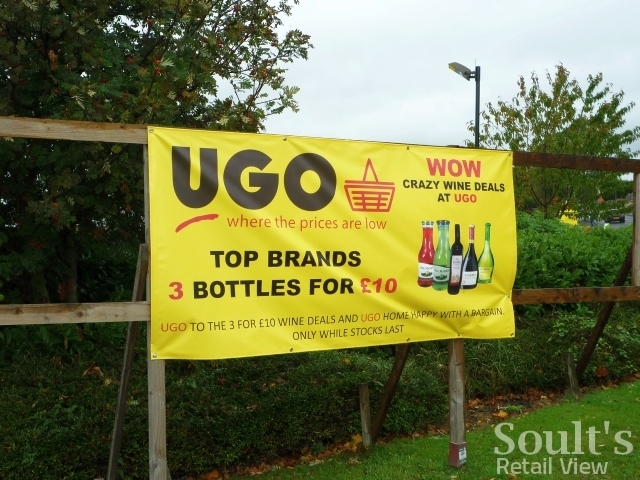 One of the barriers to being able to offer lower prices has been UGO’s reliance on sourcing products via Nisa, the buying group for independent retailers that also supplies many corner shops and, for example, the Beales Food Hall in Hexham. 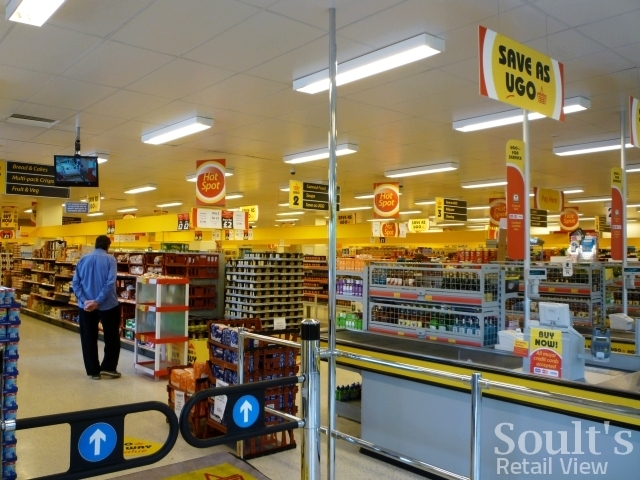 Since UGO’s launch, however, I understand that the proportion of SKUs sourced from Nisa has dropped from more than 90% to around 85% – partly as a result of the Woodhead-supplied ranges, but also through sourcing selected grocery and non-food items direct from other suppliers. 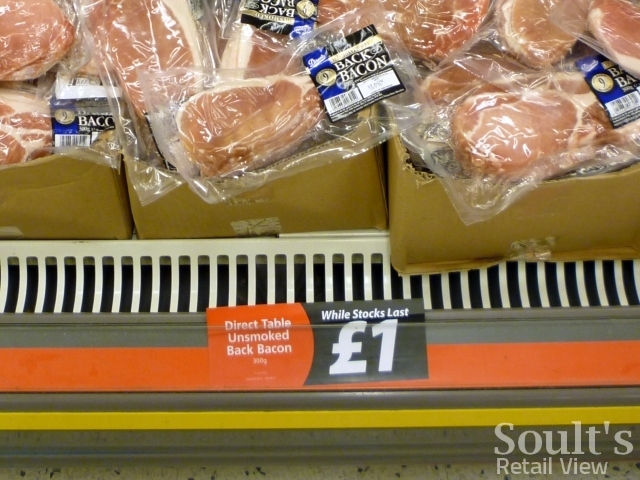 Deals on bacon, baked beans and large tins of biscuits were among the non-Nisa sourced offers instore when I visited, all of which were selling well. 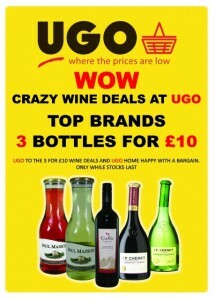 UGO also seems to have got cleverer in promoting and, in turn, delivering upon its best offers. 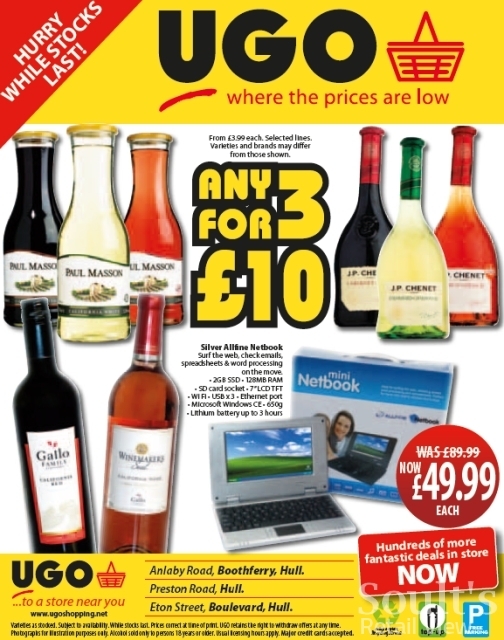 Last time, I complained that some of the deals featured on the offers leaflet were difficult to locate instore, but a combination of better POS materials and giving more powers to the store managers seems to have done the trick. 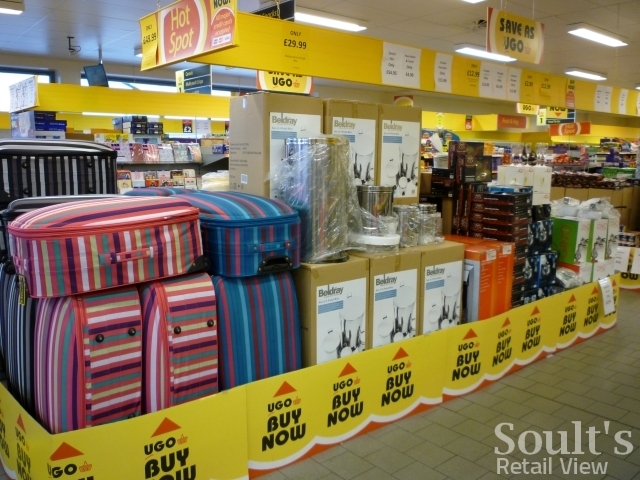 My understanding of how Netto worked is that store layouts and promotions followed quite a prescriptive set of rules, and there was limited scope for the store managers to tailor those to their local market. 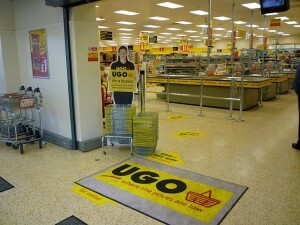 UGO’s approach, in contrast, is to give store managers greater control. At the two Barnsley stores, for example, one store manager reported doing a roaring trade in beer, while the other sells much more wine; this can now be reflected in terms of which offers are given most prominence in store. 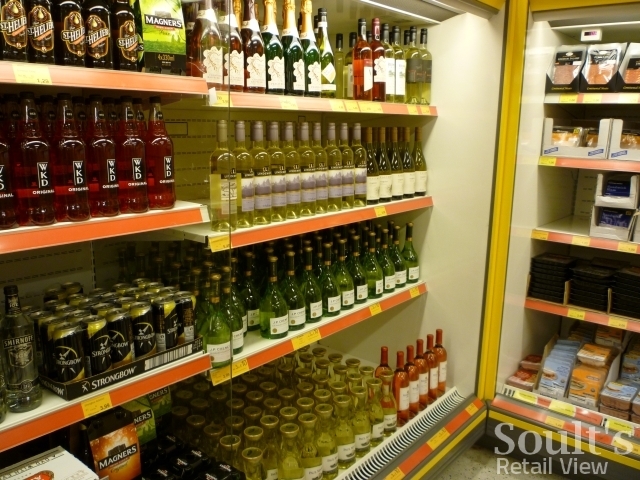 In Monk Bretton, for example, the store manager had made use of surplus fridge space to create a section of chilled wine, which he reported was selling well. 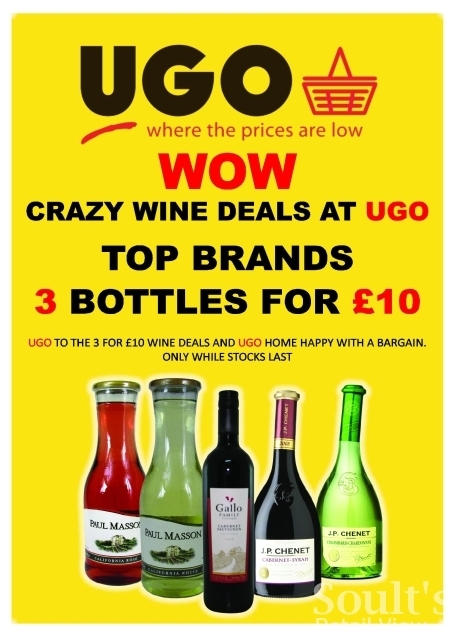 Indeed, when I visited, all the stores were making a big push on the 3 for £10 wine offer that I mentioned before, reinforced by the door-to-door leaflet deliveries and newspaper adverts in those locations where UGO has multiple stores – namely Barnsley, Hull and Liverpool. 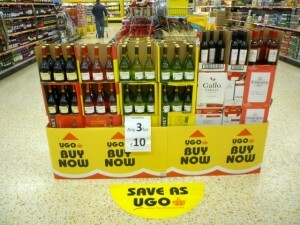 As the sales uplifts show, the wine offer has been a really successful footfall driver – after all, it is a good deal. 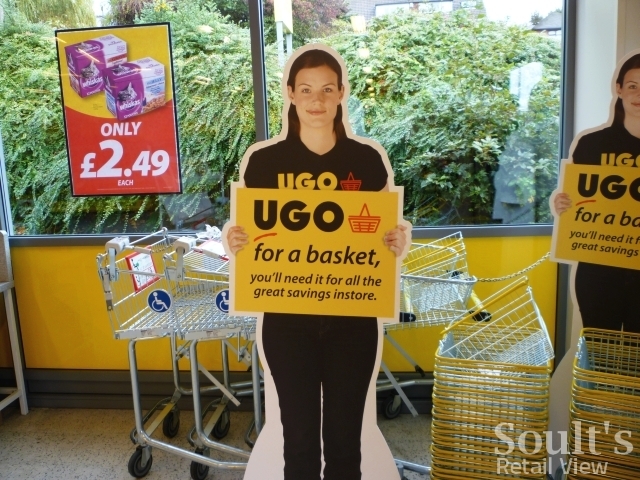 More importantly, UGO will be hoping that by bringing lapsed Netto or UGO shoppers back into the store – and, perhaps, attracting some completely new customers – it will open shoppers’ eyes to how the overall offer has improved from those early days. Finally, to customer service – another area where there were shortcomings last time. In Eston and Hartlepool in May, the staff didn’t seem particularly happy, perhaps because they were having to deal with customers who appeared confused by the change from Netto, and who were complaining about the relatively poor levels of availability. Five months on, and I couldn’t have been more impressed by the store managers and other staff that I met. In each of the four shops that I visited, the managers were motivated, enthusiastic, and clearly proud of their stores. 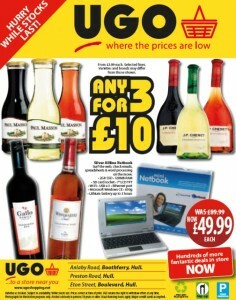 Staff on the tills were also actively promoting the current offers, such as the deals on wine and tinned biscuits. In all the stores I visited, only the security guards – typically – struggled to raise a smile. Despite the customer service shortcomings, one of the features I praised at Eston and Hartlepool last time was the smartness of the staff, and that was the case in Barnsley and Hull too. The staff uniforms – especially the bright yellow shirts – are eyecatching and good quality, which helps to convey a professional and positive image. The stores look appealing, thanks to their staff and managers – who are superb – having a real sense of ownership. Of course, there are still things that need more work. Last time I lamented the lack of any UGO-branded carrier bags, as it’s such an easy way to let customers promote the brand as they walk to and from the store. 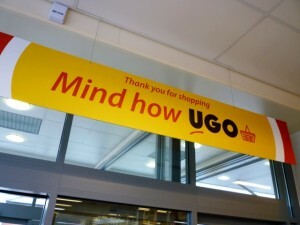 Apparently there have been some UGO-branded bags since my last visit, but the quality was poor, and some better ones are currently being sourced. Nisa bags are being used in the meantime. There’s obviously also a need to get the stores trading better, but at least now there’s every reason to expect that customers will like what they see once they step through those doors. The success of the recent wine deal has shown that new and lapsed customers alike can be enticed back if the offer and pricing is right. 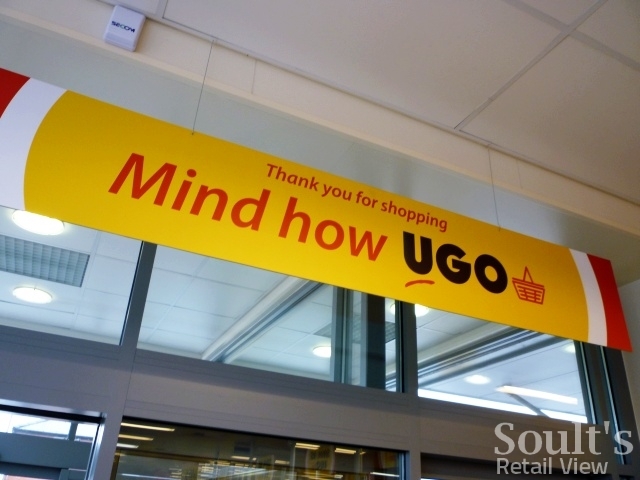 Above all, I think there’s a sense that UGO is starting to work out what it’s trying to be, and is establishing a brand personality and identity distinctive to that of Netto from which it has evolved. With recent changes to the top team and more power to store managers seemingly having the desired effect, UGO appears to be on the right track – it just needs to keep doing what it’s doing, and to keep doing it smarter and better. One year on from the closure of BHS, what has become of the eight North East stores? 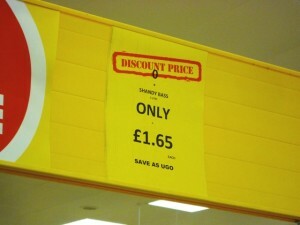 UGO in Bury has never really come up to expectations. 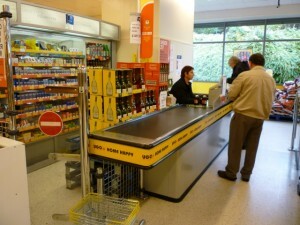 When first opened many of the products were as Netto but unfortunately the customers did not come through the doors. 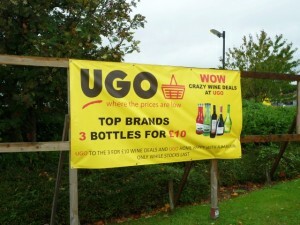 Whether this was due to a lack of advertising or just confusion over which stores would be Asda, Morrisons or UGO. 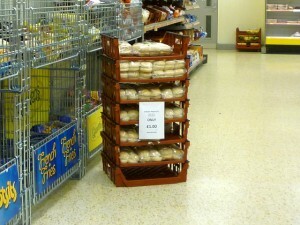 As the weeks and months passed the range has reduced, the prices have risen and even less customers. 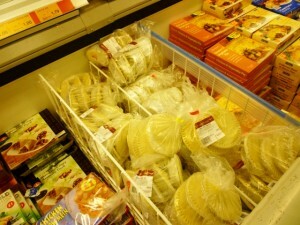 A concern over identity came when all the Heritage brands and Nisa bags appeared. 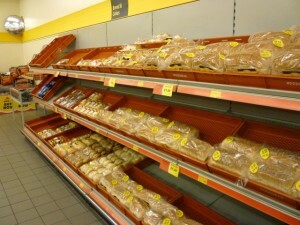 Now in 2012 the situation is even worse… Saturday Jan 21st and whole shelves are filled with single product, very little choice and fresh product levels low or non-existent. Many of the floor displays have been removed and there are few special promotions leaving lots of empty space. On a positive note the products from Woodhead bakery are of decent quality and price. 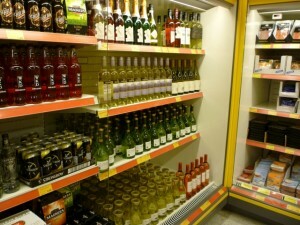 This is where the good news ends with little alcohol available and the cigarette gantry nearly empty. 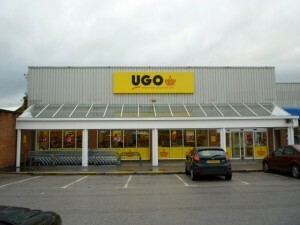 I had hoped that UGO would have stepped into Netto shoes but unfortunately that has not turned out to be the case. Reading the short history of Haldanes doesn’t fill me with much confidence for the future of the retail group either. I hope things do turn round for them but if things continue as they seem to be …then there will be more added to the unemployment figures quite soon. I think you’re right, Dan – and the only way to achieve that will be for UGO to continue to reduce reliance on the Nisa-sourced products. 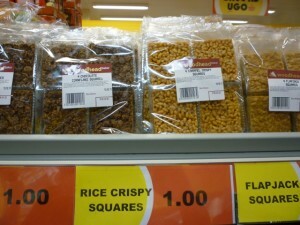 Sadly, for all the improvements you mention, the store is still far more expensive than Netto. The Nisa range is quite poor quality as well. I’m afraid the prices still need a huge amount of work.